The XT1540 interfaces analog output and discrete I/O signals between measurement and control devices over Ethernet. This discrete I/O are individually configurable for input or high-side switched output operation. • Multi-function, multi-channel stand alone module is very economical. • Built-in 10K ohm pull-down resistors for 2/3-wire sensors (contacts, promixity, TTL). • Configurable normal/reverse input logic. • Outputs include built-in read-back capability. • Easy setup with Windows software via USB. • i2o peer-to-peer updates based on change-of-state and/or timed updates. • Continuously changing “heart-beat” register validates module operation. • High-Density 22.5mm wide package with pluggable, front-facing terminals. 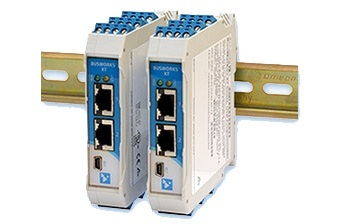 • Dual Ethernet 10/100 ports (auto-negotiation) reduce switch port requirements. • 1500V AC isolation (between I/O, power, and network ports) and surge/transient protection. • Supports bussed/rail and redundant power. • -40°C to +70°C wide temperature operation. • Withstands 25g shock and 4g vibration. • CE and UL/cUL Class 1 Div 2 Zone 2 approvals. Type: USB Mini-B type socket, 5-pin. Maximum cable length: 5.0 meters. Transient voltage suppression on power and data lines. Not required. Uses Windows HID drivers. 8-channel differential current input module, Modbus/TCP and i2o protocol. 8-channel differential current input module, Ethernet/IP protocol. 8-channel differential current input module, Profinet protocol. (4001-112, 4001-113), Ethernet cable (5035-360). female connector terminal block (1005-220) and one right side male connector terminal block (1005-221). USB-to-USB isolator, includes USB cable (4001-112).